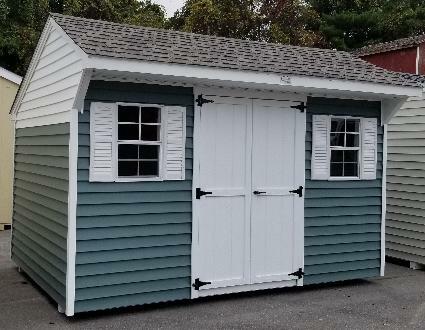 This is a used shed that has T-111 wood that has been vinyl sided. The vinyl is ivy green and white and trim is white. The roof shingles are weatherwood. It has 4' double doors that are wood painted white with white trim. There are two windows with white shutters. All our used sheds are sold as-is.